Peter Douglas Molyneux OBE (/ˈmɒlɪnjuː/; born 5 May 1959) is an English video game designer and programmer. He created the god games Populous, Dungeon Keeper, and Black & White, as well as Theme Park, the Fable series, Curiosity – What's Inside the Cube?, and Godus. He currently works at 22Cans as the founder. Peter Molyneux began his career in 1982 by distributing and selling floppy disks which contained video games for Atari and the Commodore 64. He believed that including games on the disks would improve sales, and later concluded that the games were the main selling point. He created The Entrepreneur, a text-based business simulation game about running a fledgling company. "In those days you could literally call a game 'Space Blob Attacks Mars' and sell about 50 million copies. So what did I do? I did a business simulation", Molyneux later said. Molyneux published the game himself in 1984 by duplicating hundreds of tapes on two Tandy Corporation recorders. After taking an advertising space in a game magazine, he prepared for the game's success; he later stated in an interview, "I was utterly convinced that this game would sell tons. I thought, 'You know, this letter box is just not big enough. It's just not going to fit all the envelopes.' So I cut – and this is no joke – I cut a bigger letter box". However, the game received only two orders, one of which Molyneux speculated was from his mother. In 2007, a GameSpy reviewer commented that the economic gameplay mechanics in Molyneux's Fable II may have been a descendant of The Entrepreneur, stating, "I'm a little concerned that it's Molyneux sneaking in a remix of his first game, Entrepreneur". Due to the game's failure, Molyneux retreated from game design, and started Taurus Impex Limited—a company that exported baked beans to the Middle East—with his business partner Les Edgar. Commodore International mistook it for Torus, a more established company that produced networking software, and offered to provide Molyneux with ten free Amiga systems to help in porting "his" networking software. "... it suddenly dawned on me that this guy didn't know who we were", Molyneux later said. "I suddenly had this crisis of conscience. I thought, 'If this guy finds out, there go my free computers down the drain.' So I just shook his hand and ran out of that office". Taurus designed a database system for the Amiga called Acquisition – The Ultimate Database for The Amiga and, after clearing up the misunderstanding with Commodore, released the program to moderate success. Using money earned from the database program, Molyneux and Les Edgar founded Bullfrog Productions in 1987. The company's first game was a conversion of Druid II: Enlightenment. Molyneux recalled, "I got in touch with a software company called Firebird and told them that I could program games. Of course I was bull-shitting, but they gave me Druid 2 to convert to the Amiga. You're very unlikely to get that kind of break today." Molyneux provided the original concept for Populous, the first god game for the personal computer. Released in 1989, Populous was a major success for Bullfrog and went on to sell over 4 million copies. Electronic Arts (EA), Bullfrog's publisher, acquired the studio in January 1995. Molyneux had become an Electronic Arts vice-president and consultant in 1994, after EA purchased a significant share of Bullfrog. Molyneux left Bullfrog in July 1997 to found Lionhead Studios, shortly after the release of Dungeon Keeper. According to Molyneux, his choice to leave the company was a result of a chain of events from a night of drinking with his friend Tim Rance (who would later co-found Lionhead) around 1997. Molyneux had already been contemplating his departure (in 1996 the gaming news media reported "rumors" that he was unhappy at EA and would be leaving once Dungeon Keeper was completed), and, while discussing this with Rance, Rance suggested he write out his resignation letter to EA. Molyneux typed out an email to EA's CEO Larry Probst, and before Molyneux could stop him, Rance had sent the email. Though he quickly explained the situation to EA, the event caused tension in his relationship with EA, with EA asking him not to come into the office anymore; according to Molyneux, EA feared that he would pull many of the other developers at Bullfrog along with him should he be present. EA threatened to pull support for Dungeon Keeper, which was still in progress, but Molyneux insisted they allow him to complete it, most which he did from his own home. A significant innovation of the game was its unique combination of first- and third-person perspectives, in the ability to "possess" any one of the creatures (or "minions") in the game world, yielding a first-person experience reproducing the physical characteristics, visual perspective, gait, and voice of the minion. Bullfrog continued to develop games through 2001, and in 2004 EA merged Bullfrog Productions into EA UK. Molyneux came up with the concept for Lionhead's first game, Black & White, and convinced his small staff to take on the task in late 1997. He paid the $6 million in development costs himself. After three years, in 2001, the game was finally released. In April 2006, Lionhead Studios was acquired by Microsoft Game Studios. At E3 2006, Peter Molyneux gave several interviews in the press, in one of which he stated that "I think you're going to see a lot more fantastic games from Lionhead because of that relationship [with Microsoft]." On 4 June 2009, he was promoted to Creative Director of Microsoft Game Studios, Europe, although he continued to produce video games with Lionhead Studios. On 7 March 2012, Molyneux announced that he would be leaving Lionhead and Microsoft—after the completion of Fable: The Journey—to begin work at a company founded by former Lionhead Studios CTO Tim Rance called 22Cans. To date, 22Cans has sold early access on multiple titles including Godus, Godus Wars, and The Trail. As yet, despite three years of quoted development and a large Kickstarter for Godus, no projects have left early access. Molyneux is currently working on a new title named Legacy, which he describes as "a very different kind of game." As one of the industry's leading and best-known figures, Molyneux has appeared on many television shows and video gaming news discussion or documentaries. He has been repeatedly interviewed for shows that include GamesMaster, Games Wars, Gamezville, Bad Influence!, Gamer.tv, and Games World. He also made an appearance in the Scottish web series Consolevania. More recently, Molyneux was featured within an episode of Godus alongside The Yogscast. An episode of G4's games retrospective series Icons was devoted to him, during its third season. More recently, a comprehensive two part interview was filmed of him during the 2006 Brighton Games Developer Conference by leading UK website Eurogamer. He was also featured in the fourth episode of the Discovery Channel mini-series Rise of the Video Game alongside Will Wright and Sid Meier, fellow developers of simulation titles. Molyneux was accredited in the "Top Ten Game Creators" Countdown by GameTrailers. He has given keynote addresses and spoke extensively at worldwide conferences, including Games Convention, Games Convention Asia, Develop, and the Game Developers Conference. Despite the success of his games, both critical and financial, Molyneux has acquired a reputation for issuing over-enthusiastic descriptions of games under development, which then struggle to meet expectations. This goes back to Black & White, though the most well-known case of this was with Fable, released in 2004 without many of the features talked about by Molyneux in press interviews during development. After the release, Molyneux publicly apologized for overhyping the game. In February 2014, he was quoted as being "ashamed of the final product Fable 3 and I never want to work with Microsoft again." In February 2015, Peter Molyneux stated during interviews in gaming blog Rock, Paper, Shotgun and British newspaper The Guardian that he will "never speak to the press again", after being personally attacked for not fulfilling all game promises, which ended in Molyneux announcing that he will not conduct further interviews. At the same time, gamers and game developer veterans began to question the intentions of those publications, such as Tim Schafer calling it "out of proportion" and a media hunt, saying "I'm not saying that developers like Peter and I shouldn't be responsible and accountable to deadlines. I'm just saying the reaction to recent events and the tone of that reaction is really way out of proportion to the seriousness of the events themselves." Molyneux announced a new game in April 2017 titled "The Legacy" that is in pre-production state and supposed to be "very different". Molyneux received an honorary doctorate from Abertay University in 2003. He was inducted into the AIAS Hall of Fame in 2004 and was honoured with an OBE in the New Year's Honours list announced on 31 December 2004. He was awarded the title of Chevalier de l'Ordre des Arts et des Lettres by the French government in March 2007. In July 2007, he was awarded an honorary degree of Doctor of Science by the University of Southampton and that same year an honorary doctorate by the University of Surrey. In March 2011, he was awarded the Lifetime Achievement Award by the Game Developers Choice Awards and has received a BAFTA Fellowship at the 2011 British Academy Video Games Awards. ^ a b c d e f Dulin, Ron. "Legends of Game Design: Peter Molyneux". GameSpot. Archived from the original on 1 September 2011. Retrieved 19 December 2007. ^ "Seeing next-gen games in black and white". Red Herring. 5 April 2001. Archived from the original on 1 February 2010. Retrieved 25 December 2007. ^ Joynt, Patrick (8 March 2007). "Fable 2 Preview". GameSpy. Retrieved 25 December 2007. ^ a b c "Classic Game Postmortem". Gdcvault.com. Retrieved 26 March 2011. ^ "GDC: Peter Molyneux's Accidental Gaming Career". IGN. Retrieved 2015-06-01. ^ a b McLain, Alan. "Fable – Molyneux Speaks". Xbox.com. Archived from the original on 12 December 2007. Retrieved 19 December 2007. ^ Ramshaw, Mark James (March 1996). "Generator". Next Generation. No. 15. Imagine Media. p. 24. ISSN 1078-9693. ^ "History of Lionhead Studios". Lionhead Studios. Archived from the original on 2 January 2012. Retrieved 4 February 2010. ^ Business Wire (21 September 1992). "Electronic Arts to acquire leading European software developer, Bullfrog Productions Ltd". AllBusiness. Archived from the original on 8 January 2009. Retrieved 13 April 2008. ^ a b "In The Chair With Peter Molyneux". Retro Gamer. No. 71. Bournemouth: Imagine Publishing. pp. 82–89. ISSN 1742-3155. ^ "Who Is It?". Next Generation. No. 22. Imagine Media. October 1996. pp. 17–18. ISSN 1078-9693. ^ Osborn, Alex (4 April 2017). "How a Drunken Email Led to Molyneux's Parting With EA". IGN. Retrieved 4 April 2017. ^ "Born-Again Keeper". Bullfrog Bulletin. No. 4. Guildford: Bullfrog Productions. 1997. pp. 8, 9. ^ "Company Profile: Bullfrog". Retro Gamer. No. 43. Bournemouth: Imagine Publishing. pp. 52–57. ISSN 1742-3155. ^ Geoff Keighley. "Part 2: Bored Beyond Belief / The Two Pages". GameSpot. Retrieved 13 July 2009. ^ Geoff Keighley. "Part 1: No Excuses / It's All on Me". GameSpot. Retrieved 13 July 2009. ^ "Video Games Daily | Peter Molyneux Interview June 2006 – Fable 2 & More". Games.kikizo.com. 2006-06-07. Retrieved 2015-06-01. ^ "Peter Molynuex Announces Departure From Lionhead Studios". TeamXbox. Archived from the original on 11 March 2012. Retrieved 17 March 2012. ^ "Twitter". Twitter.com. Retrieved 2015-06-01. ^ "Kickstarter: Godus". 11 November 2012. Retrieved 2016-10-03. ^ "It was tempting to retire…". Eurogamer. 2 March 2016. Retrieved 2016-10-03. ^ "Godus hopes to rekindle faith with Godus Wars". PC Gamer. 3 February 2016. Retrieved 2016-10-03. ^ "Specials". Archive.org. Archived from the original on 15 October 2007. Retrieved 2015-06-01. ^ "GT Countdown". GameTrailers. Retrieved 2015-06-01. ^ Hermida, Alfred (2004-10-08). "Technology | Fable creator explains online apology". BBC News. Retrieved 2015-06-01. ^ Laura Kate Dale. "Peter Molyneux interview: 'It's over, I will not speak to the press again'". the Guardian. ^ "Peter Molyneux Interview: "I haven't got a reputation in this industry any more" - Rock, Paper, Shotgun". Rockpapershotgun.com. Retrieved 2015-06-01. ^ "Tim Schafer says negative reaction to Molyneux was 'way out of proportion - Polygon". polygon.com. Retrieved 2017-06-08. ^ "Molyneux getting lifetime achievement award at GDCAs". Gamespot. Archived from the original on 24 February 2011. Retrieved 25 January 2011. ^ "Peter Molyneux: Academy Fellow in 2011". BAFTA. Archived from the original on 10 January 2012. Retrieved 1 June 2015. 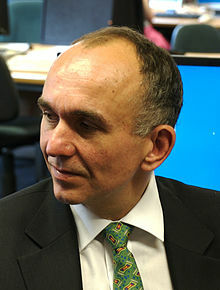 Wikimedia Commons has media related to Peter Molyneux.